What happens when a Shoe Dog is asked to re-imagine apparel? You get an unconventional perspective. 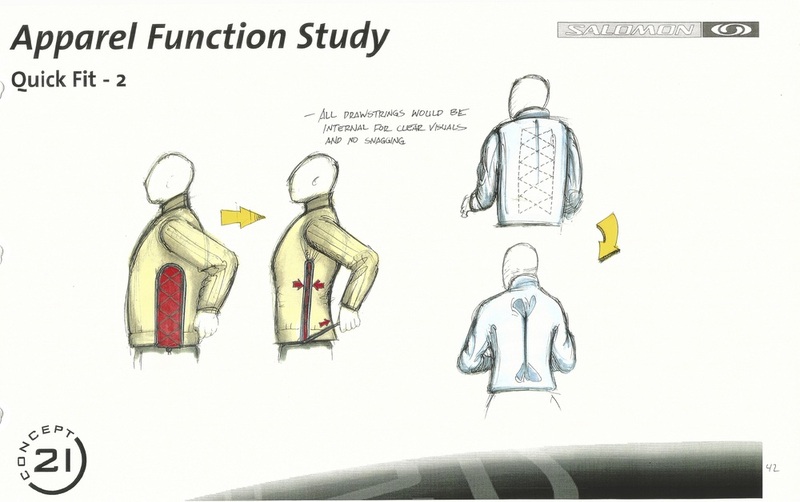 This was the case when Solomon asked me to help them reimagine performance apparel in 1998. The age-old innovation strategy of employing a cross discipline approach can often lead to product breakthroughs. This is largely due to the beginner’s mindset that is naturally adopted when tackling a project in a new discipline. This mindset allows one to question conventional thinking and hatch new solutions more easily. 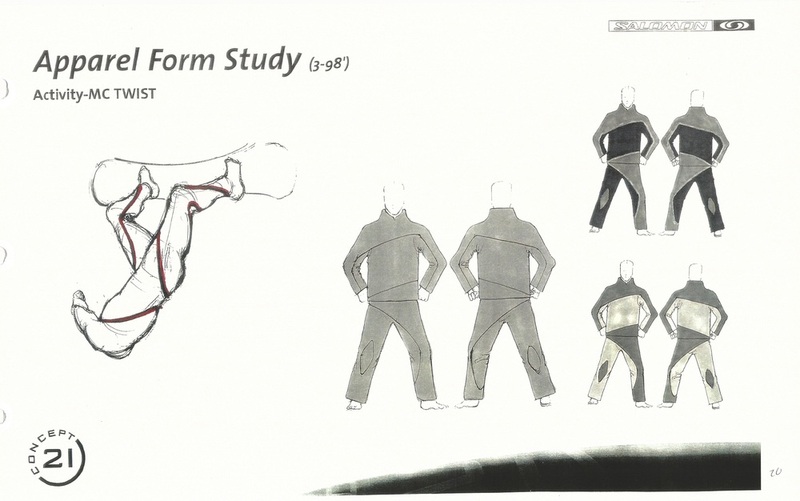 After working with Salomon to develop breakthrough products for their snowboard and footwear division, they had asked me to help them re-imagine performance apparel. Having never worked in the apparel industry, I had to rely on my footwear experience, particularly with my knowledge of how to make product for the human body. With 26 bones, 33 joints, and more than 100 muscles, tendons and ligaments in one foot, understanding body mechanics is essential when developing shoes. 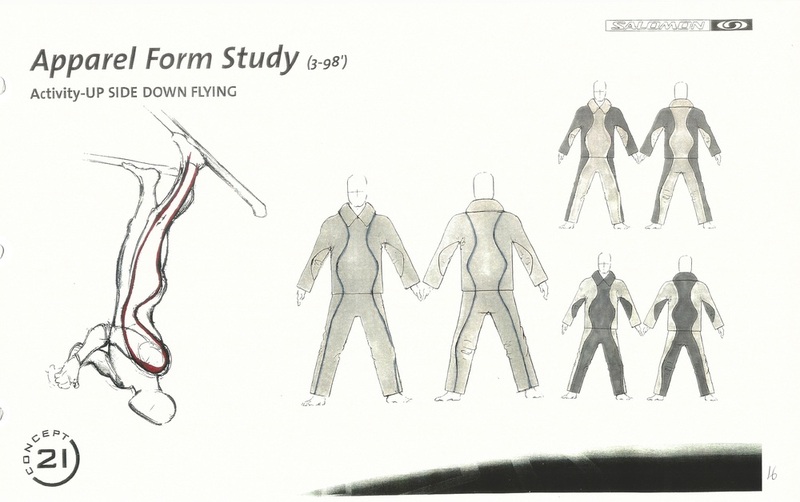 Naturally, I was curious how the rest of the body functioned and initiated a study of the form of the body, to better understand how apparel interacted with it. Today they use the buzzword, “Human Centered Design”, to explain this type of approach. To me it was just an intuitive first step. 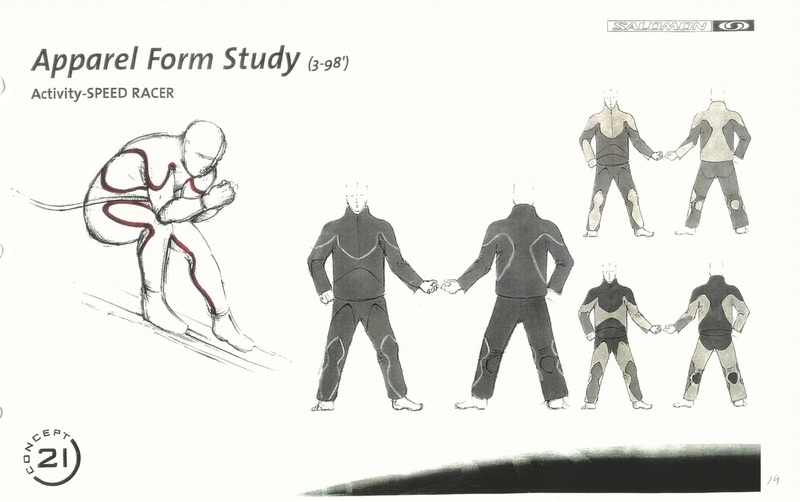 Utilizing the same principles, the design team and I went even further and studied the body in motion, particularly with the snow sports categories that Salomon was concerned with. 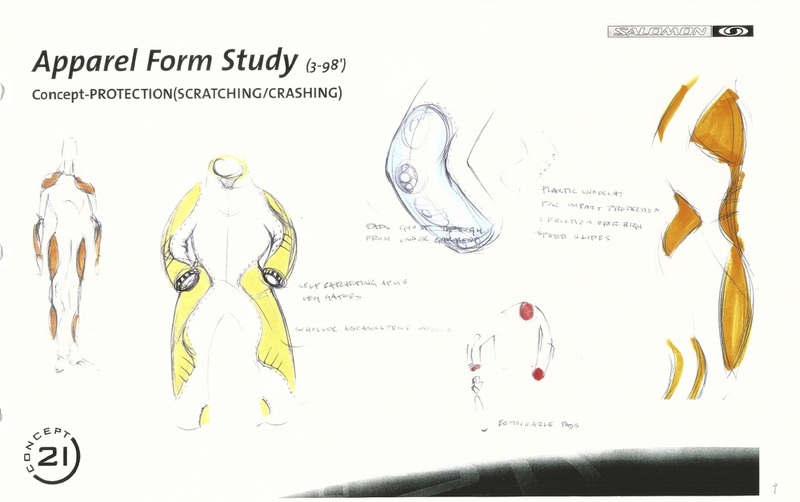 We looked at how to design the product to complement the motion of the body in a particular setting, whether it was a skier doing a backflip, riding fast down hill, or a snowboarder doing a trick. Through these studies we began to identify several attributes that were worth focusing on. Certainly understanding the body in motion was important but we knew we needed to go further still. 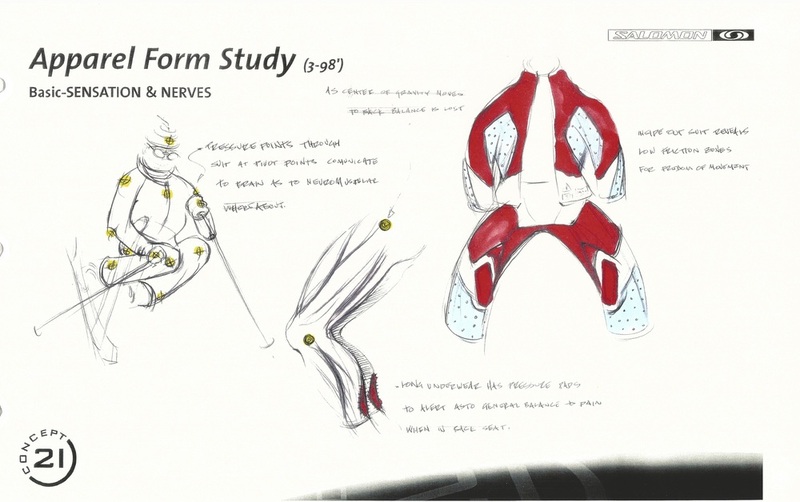 We began to think about how to design product that afforded things like flexing, regulating body temperature, location of nerve endings, and how to avoid wrinkling around pivot points to name a few. Our mission was to push far beyond conventions and develop something extraordinary. One attribute that particularly sparked my interests was temperature regulation. Growing up on the ski slopes in the Pacific Northwest and eventually joining Steven’s Pass ski patrol, where I put in 100+ days a year in the mountains, I knew first-hand how aggravating it was to overheat while skiing and then freeze while sitting on a lift. 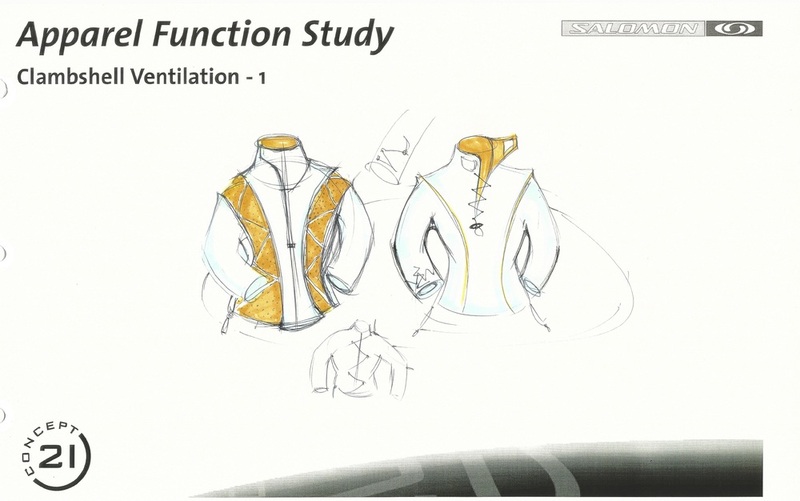 The design team and I dove into crafting solutions to address these challenges: We played with ideas that allowed heat to radiate out of the body, or escape through integrated ventilation systems. 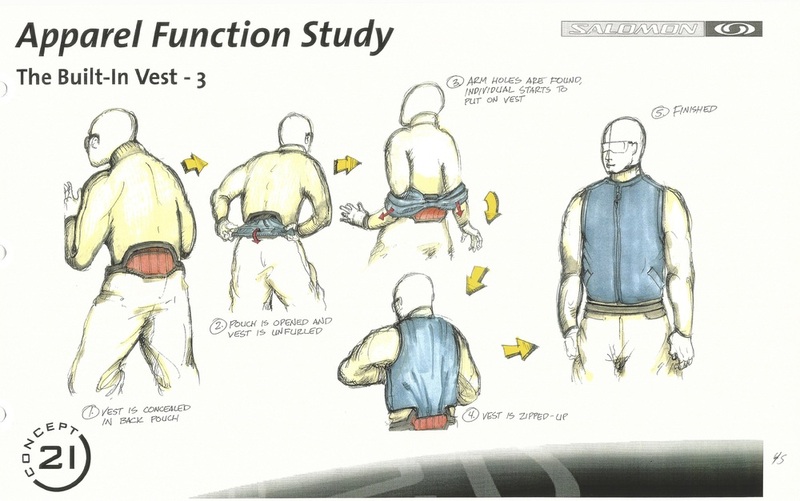 We also experimented with concepts that allowed the body to be warmed quickly. Towards the end of this project I began to realize that there was an enormous amount of technology that could be adopted from footwear, particularly, with regards to construction methods and waterproofing systems such as welded seams and hot melting techniques. Ultimately this 200 page study has proven to stand the test of time by continuing to be a source of inspiration with plenty of concepts that still have not yet been developed. I attribute the success of this project the beginner’s mindset that the team and I adopted and our cross-discipline approach. 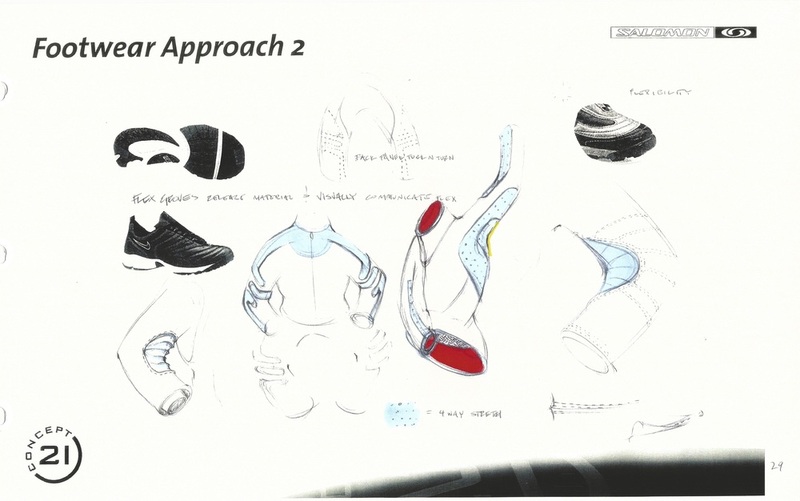 I was able to apply my understanding of body mechanics and various production methods that I learned from my footwear background. 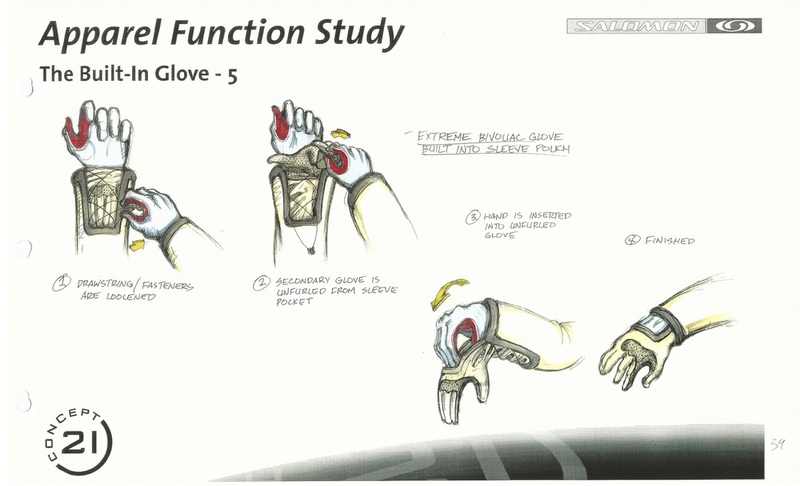 This allowed me to approach apparel from more of an engineering standpoint. But perhaps most importantly I approached this challenge not as an expert but as someone willing to be curious. This project taught me the importance of adopting a beginner’s mindset. Most recently I was reminded of this mindset during my son’s college graduation last month. One of the major themes that the commencement speaker focused was to “stay ignorant”. He pointed out that as soon as we think we are an ‘expert’ we lose the ability to think outside the box. The belief that we know everything we need to know is the biggest limitation we can put on ourselves. My challenge to you: always stay curious, explore, never ever think that you know everything and most importantly, Stay Ignorant. If we earned it please Subscribe and Share with friends! Is 3D Printing Solving A Real Need? © 2017 All rights reserved. Concept 21.